The purpose of this website is to give access to all the very latest information about the catapults of the Roman legions, in particular those used by the armies of the late Republic and the Empire. 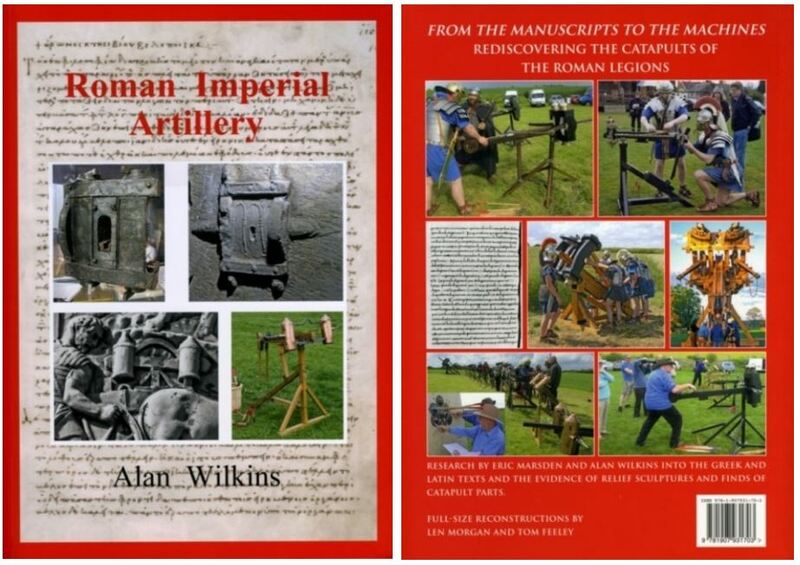 Working from his revised editions of the Greek and Latin manuscripts, plus the evidence of relief sculptures and the latest finds of catapult parts, the author, a specialist in Greek and Roman technology, has produced updated reconstructions of the catapults of the Roman army, realised as full-size working machines by his highly-skilled engineer colleagues Len Morgan and the late Tom Feeley. Solway Print Dumfries 2017. ISBN: 978-1-907931-70-3. 167 A4 pages, 140 illustrations mainly in colour. …the most authoritative review of Roman artillery for this generation, and beyond…. essential reading for those interested in military matters.. Discussions of the range and effects of the stone missiles and the use of artillery in the siege of Masada in Israel are followed by an account of the Roman defence of the Nile fortress of Qasr Ibrim, with its unique carbon ink inscriptions by five centurions on 38 of the hundreds of catapult balls. The most up to date information on most aspects of Roman artillery can be found in the editor’s new book Roman Imperial Artillery (order form below). It contains an extensive bibliography. The problem is that much of the published evidence in books or journals is only available in specialist libraries. Alan Wilkins studied Classics at Lancaster Royal Grammar School and read the subject at Emmanuel College, Cambridge, specialising in ancient history and archaeology. He has excavated on Roman military and civilian sites in Britain, and was a field assistant to Sir Ian Richmond. After 30 years teaching Classics at Merchant Taylors School, Crosby and Annan Academy he returned to research into Greek and Roman artillery, following the tragic early death of his friend Dr Eric Marsden. The reconstructions described in this book are based on his revised editions of the Greek and Latin artillery texts and the latest archaelogical finds of catapult parts. The majority of the reconstructions illustrated throughout the text have been realised in collaboration with his two highly skilled engineer colleagues Len Morgan and Tom Feeley. Several of their full-size reconstructions can be seen in museum displays on Hadrian's Wall at Carvoran Roman Army Museum and Tullie House Museum, Carlisle. He is a Fellow of the Society of Antiquaries of London.